Note: Requires QLab version 3.0.8 or later and a minimum ETC Eos Family software of 2.3.1. In the shell's network tab enable "UDP Strings & OSC"
Note: Make sure your QLab machine and console are on the same network (and subnet) and can communicate before continuing (try pinging the console from the QLab machine). 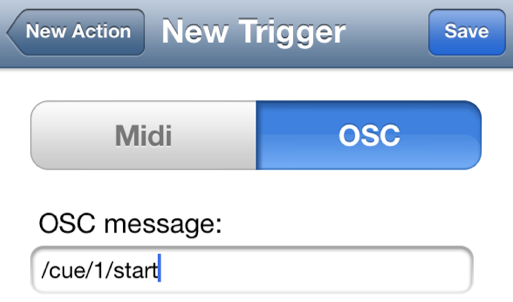 Set the Message Type to "Custom OSC message"
Try hitting "Send message" to see if this works! I have a hope that at some point figure 53 might integrate the eos OSC language directly into Qlab, however for now this appears to work fine! Note: Requires QLab version 3.0.8 or later and a minimum ETC Eos Family software of 1.9.5. Note: Make sure your QLab machine are on the same network and can communicate before continuing. These steps have now ensured that any time Cue 100 is executed it will fire Macro 101, which sends a UDP command to QLab. To un-link a cue from a Macro simply follow the steps above omitting step 4. You can also directly execute a Send_String command on a cue from Live, however this makes it a bit more work to move around and link cues. You can also build a separate cue list in the ION which only has QLab Cues and assign this to a Fader on your fader-wing. Build a stack of cues in a seperate cue list which execute a macro firing "/go"
These steps are only necessary if your IP address is not appearing within the application. Clicking the Sprocket icon in the App should show your IP address under OSC. If showing 0.0.0.0 - Force Quit the App and open it once more. The default OSC start trigger is "/cue/1/start" which conveniently is in the same format as a QLab OSC message. You can keep this format and assign any numerical or alphanumerical value between /cue / and /sta** rt/** but just remember what it is. For this example I'll be sticking with the default cue number of 1. Note: StageCaller receives on port 1234. *Press Save again if you are done configuring this Action. The default OSC stop trigger is "/cue/1/stop" which conveniently is in the same format as a QLab OSC message. You can keep this format and assign any numerical or alphanumerical value between /cue / and /sta** rt/** but just remember what it is. For this example I'll be sticking with the default cue number of 1. Slide to the right to increase the number of rings or all the way right to ring forever! Enter Cue Number - Type the cue number you assigned to trigger your start action in StageCaller [what comes between /cue/ and /start/ in the Action Setup of StageCaller. I used cue 1 in this example. Select Command - Select Start to send a start message or Stop ( if configured in StageCaller). Fire the cue and test! 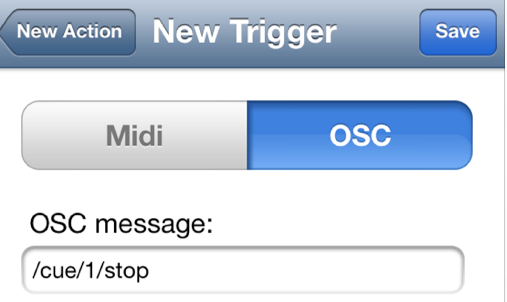 You can have multiple actions in StageCaller with the same OSC triggers. Metric Halo Haloverb - Doesn't report tail time. 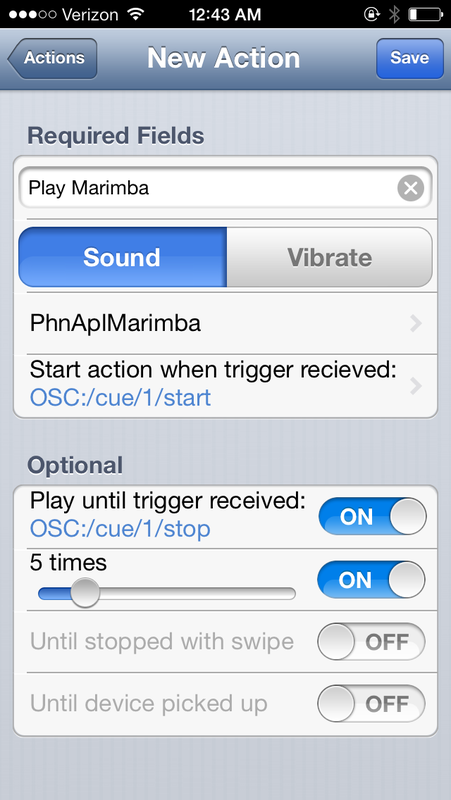 PSP EasyVerb - Doesn't report tail time, but does work on cue outputs. A lot of the simpler things that we used to do with applescripts (and even some things that weren't possible) can now be done with OSC-commands. The Playback rate of an audio/video cue is an example of a hook that isn't yet supported through Applescript. So you could assign a hotkey to an OSC-que with the custom message: "/cue/selected/rate 0.5", to slow down the selected que to 50% playback rate. set oscCmd to "/cue/selected/rate 0.5"
do shell script "echo " & oscCmd & " | nc -u -w 0 127.0.0.1 53535"
This method takes advantage of the fact that QLab listens to simple ASCII formatted OSC commands on port 53535, and the "nc" command that can send a simple string over the network from the command line. Because OSC can use wildcards, you can also do stuff through the OSC-syntax that would be much more complex in applescript. e.g. set oscCmd to "/cue/2*/colorName red"
this would give every cue who's cue number starts with 2 a red label. set AppleScript'stext item delimiters to ","
set oscCmd to "cue_id" & cue_ids & "/colorName yellow"
This would color every Video Cue in project green. Taking advantage of the fact that you can target multiple cues by using commas in your address like /cue/1,2,3/ Also note that we're using the /cue_id/ variant to target cues by their unique_id and not by their cue numbers.